Your Profile is your where your account information is. 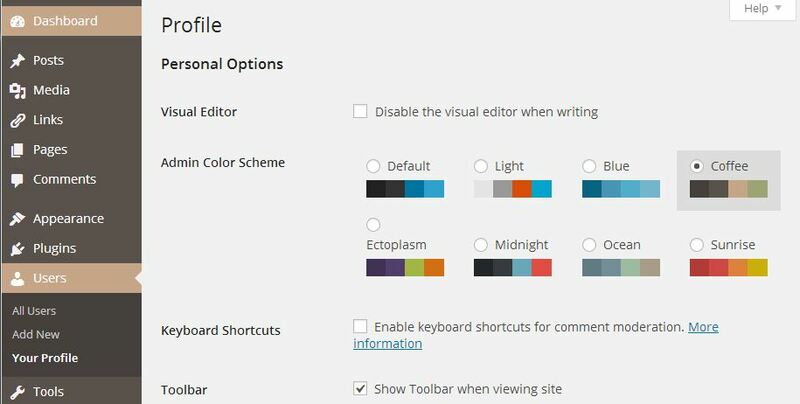 In your WordPress profile you can update your email address, create a nickname, talk about yourself, set your toolbar on or off, even select a color scheme. Everything to manage your profile is under Users in the admin menu. To manage your profile in WordPress or change your profile information navigate to Users>Your Profile. Your Profile page is rather long so I have cut the screenshot image into sections from top to bottom and numbered the areas on the image with a corresponding numbered list below. Disable the visual editor: this is not recommended unless you are proficient in working with HTML. Leave this box unchecked. Keyboard Shortcuts: use the More Information link to see what shortcuts are available and how to activate them. This is a personal choice, if you are comfortable using keyboard shortcuts. Toolbar: check or uncheck the box to have the toolbar show on the live site when you are logged in. The Toolbar is expained on the WordPress Dashboard tutorial. You are the only one that sees the toolbar even if there are visitors on your site when you are logged in, only admins see the toolbar. The minimum amount of information here is the Username which is chosen when the site is set up. It should NEVER be admin or your actual name but something that is unique to you. This will help to secure your site and as noted Usernames cannot be changed. Your first and last name are for internal use only and only real useful to the administrator and to share your info with site members on a multi user site like this one. Your Nickname is important for bloggers, choose it from the “Display name publicly as” dropdown menu. Your Nickname will appear in the in the blog meta data instead of your user name. The Contact Info section is where to update your email address. It is important to keep your email address up to date as WordPress sends notifications to this email when you have a new comment on your blog or when you request a new password. The other areas again are mainly for multi user sites where you want to share your information with other users. In the About Yourself area write a short bio which will only appear when someone clicks on your name in the blog metadata. If your theme has an author template your bio information will open there. 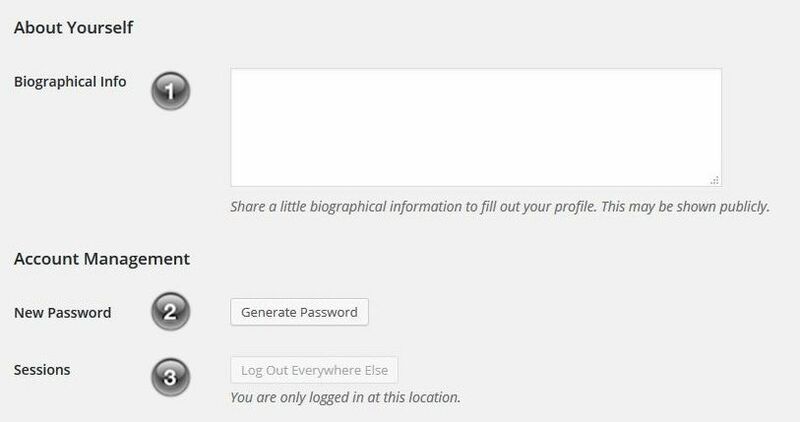 If you do not want to use this feature of WordPress then don’t fill in a biography. If you are a member on a multi user site like this one, you can share your bio with other users. After you are finished, click the blue “Update Profile” button to save your changes. Quick Study: This video is short and sweet and will walk you through the above options. Your Profile page on this site is exactly the same as your WordPress site. Why not try and insert more information here to see how it works. Click on your name at the top right corner, where it says “Howdy,…” to get there.